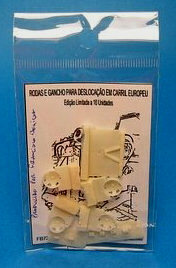 Resin conversion kit for the Airfix kit (but will probably fit other kits with minor adjustment). No decals. Casting quality is very good, with parts on a thin carrier film (as usual for resin kits). Minimal clean-up is to be expected. The set consists of 4 railroad wheels, 4 attachments for the wheels on the hull and a tow bar + stowing attachment. Very minimal instruction sheet consisting of 3 drawings. Together with pictures found on the weblog http://fbminis.blogspot.com/ these should be sufficient for the conversion. Nihil. 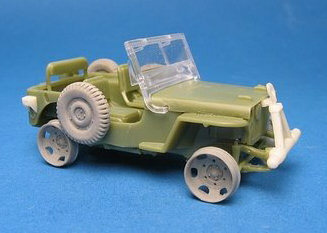 There is one picture of the real vehicle on the weblog. Nihil, apart from the info found on the FBMinis weblog. With thanks to FBMinis for the review sample.